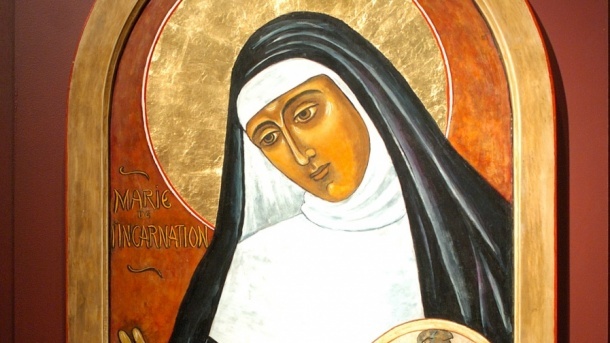 Saint Marie of the Incarnation: she meant business. Saint Marie of the Incarnation, the most significant leader to establish the Ursuline Convent in Quebec. She was born as Marie Guyart in Tours, France in 1599. At about 14 years of age she saw that she could join the convent, but she sensed her mother did not share the same vision. She ended up marrying a silk merchant named Claude Martin and together they had a son. Unfortunately, when their baby was only six-months-old, Marie became a widow. Called again by God, after much discerning, she got rid of the family business and entrusted her son to her sister and brother-in-law to take the Ursuline veil. Who was Marie of the Incarnation? She is considered a mystic of the Church as she had extraordinary encounters with our Lord and our Lady, which directed her in the path to bring the Faith to the peoples of New France. Among her many accomplishments, Saint Marie learned the languages in her surrounding areas and even developed dictionaries in Algonquin and Iroquois, a sacred history in Algonquin, and a catechism in Iroquois. She was among the first women missionaries in North America. Her life and her spirituality have inspired many people around the world, spanning from other regions of Quebec, Peru, Japan and the Philippines. In Quebec you can find the Marie of the Incarnation Centre. In June 22, 1980, Pope John Paul the II declared her Blessed. How can we be like her? Saint Marie of the Incarnation is described as having been generous, intelligent and of strong character. Despite having gone through the loss of her husband and becoming a widow, she did not lose her love for Christ. Furthermore, when she was called by God again to live the religious life, it required faith and great generosity to go forth and leave her son behind. Unlike her, we may not experience miraculous encounters with Jesus and our Lady, nor may we have to endure the sudden loss of a spouse and the eventual separation from our own young child. However, like her, we are all called by God in our own unique way. It is one thing to receive a call from God and another to answer it. Everyone has the capacity to ask God what it is he is asking, and with His grace and our cooperation it can be accomplished. Just as Marie of the Incarnation had to make great sacrifices, we too may feel the burden of following Jesus. But we must remember that our Lord cannot be outdone in generosity. She had a great ability to work, and to work hard! She was a skilled businesswoman and was able to use all her talents and skills to serve others. Her many roles included: Mother superior, assistant, bursar and formation director for novices. Each of us are given our own set of talents and skills and we can seek God’s guidance on how to use them for His glory, just as Blessed Marie did. It is said that when Marie was granted the permission to build a monastery and school she prepared the plans, hired workers, and oversaw the construction, even going as far as climbing scaffolding! Courage requires conviction and faith. To have a strong character like Marie, we too have to convince ourselves that our Lord is on our side, no matter the human circumstance. But firstly, to discern well what His will is, and then we can go courageously forward with determination. We can go to Saint Marie and ask for help in experiencing a similar closeness with Jesus and Mary, to assist us to be detached from the things of this world and to work with zeal to fulfill God’s plans in our lives. This special intercession can be sought out at any time, but especially on April 30th, her feast day.